I hiked up Avalanche creek to Avalanche Lake, Colorado a few weeks ago. It's a 10 mile (15km) hike up to 10,500 ft which I did over a leisurely 4 days. The plan was, as always, to fish along the way but this time I wanted to compare my Tenkara setup to my UL spinning rig. I've been spin fishing more and more lately, mostly because I've been fishing bigger water and targeting species other than trout (not that I believe tenkara is only for trout, I've had a lot of pleasure fishing smallmouth bass with tenkara rods). I compared the Tenkarabum 36 rod with 2.5 level line and 6x tippet to my Daiwa Wise Stream 5ft-6in telescopic rod with a Shimano Sedona 500 reel and 4lb fluorocarbon line. I carry the TB36 in a thin wall ABS tube with end caps and add a line holder and a very small box of flies. For the spin rod I add a (very nice) protective carrying case that came with another Daiwa telescopic rod of mine (the BBB 6106 TMLFS, which is a gem), a neoprene reel cover and a few lures. I mostly fished the tenkara with a UKB and kebari flies whereas the spin setup was mostly fished with a gold coloured Mepps #1 spinner. Which setup is better for this type of hiking/fishing adventure? This is not as easy to answer as I would have though. From a weight and encumbrance point of view the tenkara setup wins hands down. I don't have a scale to provide the exact weights but the tenkara rod + accessories are lighter. Although, for me, the weight difference is isn't that great because of my relatively heavy ABS tube to carry the TB36. If you're counting oz's, go with a tenkara rod. The tenkara setup also wins from a reliability standpoint. I have broken several tenkara rod sections over the years (that's why I normally carry two tenkara rods on this sort of trip) but the spin setup just has more things that can go wrong. Indeed I broke the handle on my reel on this trip. The rod, with reel mounted, was strapped to the side of my backpack and when I set the pack down with a little too much enthusiasm, it landed on the sideand the handle broke off. Lesson learned, always retract the handle!. As luck would have it, earlier on I found a tie-wrap on the trail and used this plus some duct tape I always carry with me to MacGyver a solution (see photo) and was able to use the reel adequately for the rest of the trip. Now for the actual fishing. The lures/fly weight difference means shallower water fishing was better with tenkara and deeper pools were better with the spinning rod setup; no surprises there. The spinning rod also has a greater casting distance. The tenkara technique has better accuracy and precision, generally speaking, but with practice I could probably get just as good with a spinning setup. The greatest advantage with the spinning rod comes from the underhand cast. I could get my lure under overhanging shrubs and trees (prime spots always) using this technique in a way which is impossible for me using a tenkara rod. Yes, a side cast works pretty good with a tenkara rod but is not always possible on a small stream due to lack of space. The underhand cast with a spinning rod requires no space behind you or on either side, it rules! I didn't keep a close count but generally speaking I caught more but smaller fish with tenkara and less but bigger fish with the ultra-light spinning setup. Again, not too surprising considering that lures are better than flies in deeper water where the bigger fish hang out. Yes, I have heard of split shots to get nymphs deeper but still, Mepps get there faster and are better in my opinion. Once I got to Avalanche Lake there was too much wind to use my tenkara rod effectively. The No. 1 Mepps on the UL setup simply slaughtered the Cutts. These were 16-20 inch fatties, generally 20ft to 40ft offshore at 6-10ft depth and they viciously attacked the lure. I only fished for 2-3 hrs in total, late one afternoon and mid morning the next day. I caught 8-10 fish without much effort. I also fished with 3" Z-Man minnows on a 1/16 oz jighead (no success, one bite) and Eurotackle Micro-finesse anisoptera on a jighead (some success). I don't know what it is about spinners but they've been very effective for me all summer on many different species (Musky, Bass, Pike, Walleye, Trout). I think the spinning motion just annoys the hell out fish, especially the more aggressive alpha types. So all in all I think the UL spinning setup catches more fish in a greater variety of water and if I had to absolutely catch fish to survive on this sort of outing it is what I would choose. The tenkara rod has the advantage of being lighter and more reliable and takes up less space. The tenkara rod is also more exciting to fish with as most readers of this site will know. 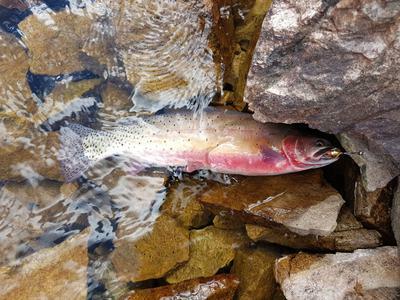 An 8 inch trout on a TB36 is more exhilarating than a trout twice that size on a spinning rod, even a quality ultra light rod like the Wise Stream. As an aside and a follow up to the RMNP post awhile back; I saw only one other person fishing in the 4 days I was in this area. Colorado is a big place and if you're looking for solitude there are several places to go. I have a couple friends who hiked the John Muir Trail in California. 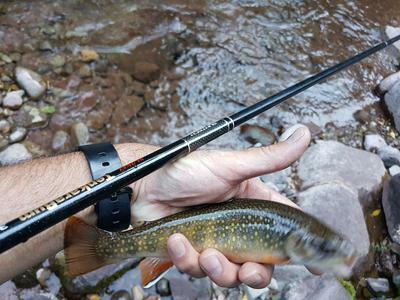 One reported that tenkara worked nicely in the streams, but the spinning rod worked so much better in the lakes that of the two, if you had to rely on fish to eat, you should bring a spinning rod. That said, a tenkara rod with its minimal gear takes so little space and weighs so little, you might as well take both! I appreciate your thoughts and analyses on your fishing experiences. I almost always carry an ultralight spinning rod and 1-2 tenkara rods on my forays into high mountain lakes and streams in the Rockies. Nothing screams FUN! like a 5" Brookie caught on a light Tenkara rod and line. Like you, I find the spinning rod to be much more versatile on bigger water, and an assortment of Mepps spinners size 0-1 make up the majority of my spinning tackle. Gold and flourescent pink or orange are nearly always winners. Sometimes a small Daredevil spoon will also entice a bite. Adding in a Cast-a-bubble for attaching a fly to get out a bit farther than the Tenkara rod can reach pretty much covers all the bases. Thanks for the great report. I too have been doing more spin fishing of late. I do like the simplicity of fixed line. My only comment is you forgot a long rod. I only got to do one hike in for more than one day this summer. I not only took my TenkaraBum Traveler 44 that can be fished at 36, I took my Suntech Keiryu Sawanobori 63. With the longer rod, I could get out to the drop-offs where the bigger fish hang out. I always take the Kurenai 30 as well for the creeks. I now view spinning vs fixed as comparing apples and oranges. They are different, but both very fun! I just don't compare them anymore. I continue to compare spinners to spoons. I am finding the Japanese Domestic Market Spoons that Chris sells over on the Finesse Fishing site work way better than what you can buy here. On my last hike in, no creek to fish, the spoons out fished the spinners. You can manipulate a spoon a lot more different ways than a spinner. I've always been a die-hard fly fisherman, working the little front range streams, mostly getting skunked. 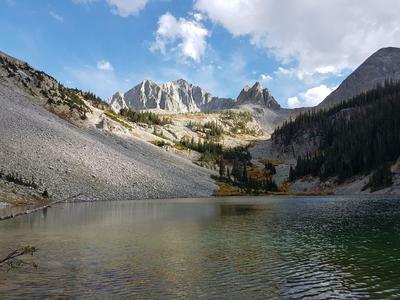 A few years back, a good friend and I hiked to one of the high-country cirque lakes, late in autumn (already snowdrifts in the shade), for what Zeke called a "meat haul". Spinning rods, water-filled bubbles and a gold ribbed hares' ear on the end of the tippet. The weight allowed the cast to extend just over the lake's drop-off, where these hungry, spawning brookies took about every third cast. 10-14 inches each. As Zeke would say, "more fun than shootin' rats at the dump..." Brought a half dozen home for quite the dinner, packed in the snow along the trail.